The NCAA Men's Division I Basketball Championship is held each spring featuring 68 college basketball teams in the United States. The 20-day tournament, colloquially known as "March Madness" or the Big Dance, has become one of the United States' most prominent sports events. 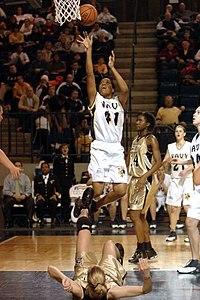 Navy Midshipmen Nikki Curtis gets a shot off over an Army West Point cadet during the Women’s Army-Navy basketball game in Alumni Hall at the U.S. Naval Academy. Navy edged out Army, 75-73, as part of a double header which pitted both the men and women of the two academies against each other. ... that University of Pittsburgh center DeJuan Blair grew up 600 yards (550 m)* from the university's campus? ... that University of Notre Dame power forward Luke Harangody and his brother were banned from playing basketball in their backyard as children because their games regularly ended in fights? ...that when Drake University basketball player Adam Emmenecker was named 2008 Missouri Valley Conference Player of the Year, the conference called him "perhaps the most improbable Player of the Year" in its history? ...that a Spokane, Washington television station devoted the first 11 minutes of its Saturday evening newscast to the February 2007 arrests of Gonzaga University basketball players Josh Heytvelt and Theo Davis? ...that George Mason University head coach Jim Larranaga motivated his players in their 2006 NCAA regional final by telling them their opponents from the University of Connecticut didn't know what conference they were in? ...that Hakeem Olajuwon was the last player to be named Most Outstanding Player of the NCAA tournament while playing for a team that failed to win the title, earning the honor in the 1983 tournament? ...that Mike Gansey was the only men's player in NCAA Division I shorter than 6 ft. 5 in. to figure in USA's top 50 in field-goal percentage for the 2005-06 season? ...that basketball coach Bob Knight told a radio program that if he had not been fired from Indiana University in 2000, he would have fired his assistant Mike Davis, who replaced him as IU coach? ...that over 50 parents contacted Gonzaga University's athletic department on the first day that a Sports Illustrated issue featuring a story on Gonzaga player Adam Morrison and his life with Type 1 diabetes was available at retail outlets? ...that the UCSB Events Center, the home of the basketball and volleyball teams of the University of California, Santa Barbara, is famous for a tortilla-throwing incident in a men's basketball game televised on ESPN? Michael William "Mike" Krzyzewski (ʃəʃefˈskiˌ) (pronounced "shuh-shef-skee") (born February 13, 1947 in Chicago, Illinois), often referred to as Coach "K", is the head coach of the Duke University men's basketball team. The program has been one of the most successful of the 1980s to 2000s. He also was picked to coach the United States men's national basketball team, which includes the 2008 Summer Olympics.